ps: I got my free pastry yesterday with my Starbucks order… I enjoyed a non fat black tea latte with reduced fat chocolate chip banana bread! It was super-d-delicious! Did you get to pick up yours??? This entry was posted in Book Progress, Loom Knitting. Bookmark the permalink. The star is awesome, Bethany – I love it! The circle on the bottom left looks like the loom knitter’s circle I use as the foundation of the granny squares. 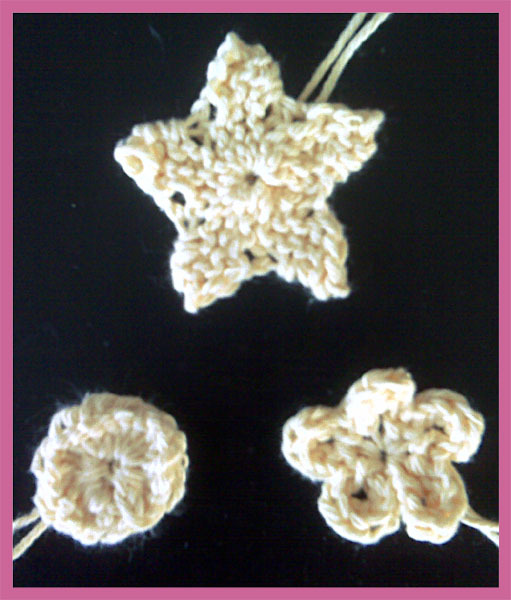 It’s very versatile and can be modified and used in many ways: flowers, amigurumi ears, buttons, etc. I was thinking that too Brenda 🙂 I love the star especially – very good idea!!! Keep up the good work. Thanks so much, Gals! 🙂 Brenda, I’ve been dying to see how you did your pretty granny squares…can’t wait!!! Do you know when we might be able to share in your great granny knowledge, lol? Brenda has the tutorial up on her site now. It’s on the right hand side under loom knitting techniques. I posted the granny square tutorial over a week ago (thanks to Kelly’s encouragement), but just never blogged about it. the first place I used what I call the LMC (Loomer’s Magic Circle) was in the Watermelon Coaster tutorial. The coasters were sort of the springboard for the granny squares. I have used modifications along the bind off edge of the LMC to create a number of items. Oooh, looking super, Bethany 🙂 Love them! Especially the flower, hehe. Hugs! You’re absolutely right, it’s really a very nice base shape for many things…thanks again! OOHHH Love those. How cute!! I’ve been AWOL lately and still behind. Book? Are you publishing a book? What book? When? Where? I need info, LOL! Really, great job on them. Love the star, flower and circle. So many ways to use those! So many possibilities for them. BUT….I also included an optional Knifty Knitter version in the pattern instructions, as well as a loom gauge chart, so you should be able to to transfer to another loom if you so desire. 😉 Give me a hollar if you need any help with that, K? Enjoy your day…and those booties! Hello, there Linda! 🙂 It’s always so nice to hear from you! Book: yes, I’m finally biting the bullet, taking the dive and going for it, lol! I decided that I needed to stop spinning my wheels and focus my efforts on a single project that will be a benefit to all…in book form. 😉 I’m intending on self publishing when it’s all complete and will keep everyone posted on my progress along the way. I’m pretty excited, and feel very good about this decision. Thanks for the enthusiasm about the little shapes! You can bet they’ll be embellishing some projects in the near future, lol! Thanks so much for stopping by and commenting, Linda…have an excellent day!